I’m excited to participate in the blog tour for The Good Karma Diet by Victoria Moran with an excerpt and recipe from the book. To add to the “good karma” there’s also a giveaway at the end of this post to win a copy of the book, so be sure to enter. “Good Karma eating is as simple as can be: comprise your meals of plants instead of animals, and most of the time choose unprocessed plant foods, meaning that they got from the garden or orchard or field to your kitchen with minimal corporate interference. this way of eating gives you good karma in two ways. The first is self-explanatory: by eating foods of high nutrient density and avoiding the animal products and processed foods your body can have trouble dealing with, you’ll reap the rewards of improved health. The second is a bit more mystical: you do good and you get good back. As is true for life in general, it’s probably better to do this with unselfish motives, but even if your motivation is to become thinner, healthier, or more youthful, you’ll be doing something modestly heroic at the same time. This way of eating and living could lessen the suffering of billions of animals. I know it’s hard to think in terms of billions, but if you imagine counting the individual beings one at a time, you get some of the impact. In addition, ninety-eight percent of the animals raised for food suffer horrifically on factory farms before being slaughtered, often in adolescence. Every time you eat a vegan meal, you’re voting for something different. This choice also lightens the burden on the planet. Raising animals for food in the numbers we do today calls for an exorbitant amount of water and fossil fuels. It leads to vast “lagoons” of animal waste, and the release into the atmosphere of tons of greenhouse gases, mostly in the form of methane. What you have here is holistic dining at its finest – body and soul. Eating whole, plant foods is scientifically validated as being both nutritionally adequate and anti-pathological. In other words, it cures stuff. Not everything. But reversal of such scourges as coronary disease and type 2 diabetes among people on this kind of diet has been repeatedly reported in the scientific literature; and the preventive potential of this way of eating is supported by ample research. If this sounds great but going all the way seems impossible right now, go partway. Americans’ consumption of animal foods has, as I write this, been decreasing annually since 2007, primarily because non-vegans are making vegan choices some – or much – of the time. They fix a veggie-burger or black beans and rice, or they order their latté with soy, or have a green smoothie for breakfast so they’ll look prettier and — what do you know? — the statistics get prettier, too. Once you’re fully vegan, celebrate! The only thing you need to “do” nutritionally that you weren’t doing before is take a vitamin B12 supplement of about 100 micrograms a day as a tiny, tasty, melt-in-your mouth tablet. B12 is not reliably found in plant foods unless they’ve been fortified with it, and lack of B12 is dangerous. This single missing element in a plant-food diet pains many vegans. If this is the perfect diet, it ought to be, well, perfect. But this is life on earth: extraordinary, magnificent, and absolutely not perfect. Bacteria in our mouths and intestines do make some B12, and maybe at some point in evolutionary history we all made enough, just as our long-ago ancestors made their own vitamin C and now we don’t. I look at taking B12 as a tiny surcharge for the privilege of being vegan. If you hear yourself saying “I could never give up ice cream” (or something else), realize that you may just be short on vegucation. There are lots of rich, luscious nondairy ice creams on the market, and you can make exquisite homemade ice cream with only a DIYgene and an ice cream maker. If you have the information and you’re still saying “I could never give up. . .,” listen to yourself. You’re affirming weakness. You’re bigger than that. You can eat plants and save lives. You can give your life exponentially more meaning by living in a way that decreases suffering just because you got up and chose a kind breakfast. 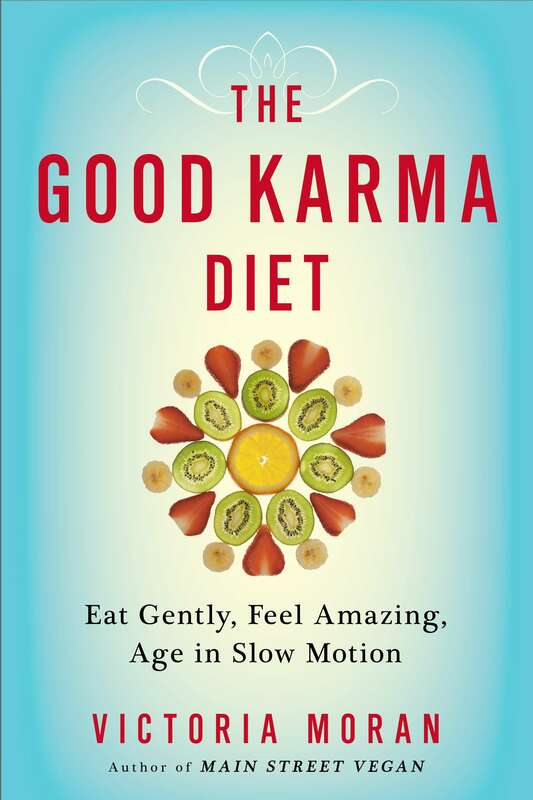 Excerpted from THE GOOD KARMA DIET: Eat Gently, Feel Amazing, Age in Slow Motion by Victoria Moran, with the permission of Tarcher/Penguin, a division of Penguin Random House. Copyright © 2015. 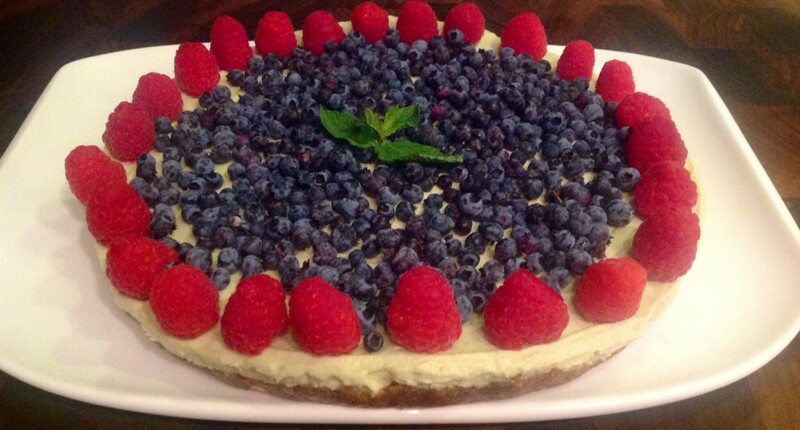 Photo and recipe by Doris Fin, CCHP, AADP. 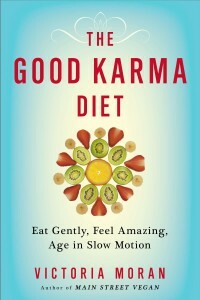 GIVEAWAY: Leave a comment at the end of this post and be entered to win a copy of The Good Karma Diet. Tell me: What’s your favorite unprocessed vegan ingredient? This contest closes on May 11 at midnight. The winner will be announced on Tuesday May 12.
great recipe! I’m excited to read the book. My favorite unprocessed vegan ingredient is pumpkin …. I love it???? My favorite unprocessed vegan ingredient is pumpkin …. I love it! My favorite vegan food is peanut butter. Yum! I just requested my library buy your book. This book looks great! I’m not sure I can choose just one favorite but I probably consume more bananas than anything else! I love potatoes! You can do so many things with them. So many, but probably berries, raspberries in particular. I put them in smoothies and oatmeal pretty much every day. Thanks for the chance to win! Yikes okay dates though we rarely buy these due to cost in our area are my favorite BUT if I had to pick something based on common usage short grain brown rice. Lentils, they are so versatile and packed with protein. I actually eat mostly unprocessed seasonal vegan foods now – until about 8 years ago, all I ate was pizza, burgers, chicken, and pasta, so I’ve come a long way! My absolute favorite food is butternut squash. I love it when fall comes around! Avocado! Thanks for the giveaway!! my favorite unprocessed ingredient is sweet potatoes and yams! orange, white, purple…delicious steamed, baked, shredded raw…i use pureed/caramelized for baked goods in place of fat and sweetener…slice thin and bake for chips…mix with garlic, smoked paprika, nutritional yeast for ‘hummus’… mix with cacoa and dates and freeze for ‘ice cream’…and just eat plain for a filling and healthy snack! My favorite unprocessed ingredient is red peppers. avocadoes are my favorite…. would love to read the book! My favorite unprocessed ingredient is avocado. My favourite unprocessed vegan food would be cauliflower. My favourite unprocessed vegan food is almond butter. It would probably be cashews as they are so versatile! My favorite ingredient would be avocados!! So versatile, in sweet or savory dishes. Or just on their own with a spoon! Yummo. My favorite unprocessed vegan food would be mushrooms – breakfast, lunch, & dinner possibilities galore! My favorite unprocessed vegan ingredient is STRAWBERRIES. Love’em! This recipe looks great. My favorite unprocessed vegan ingredient are avocados. Thins for the chance to win the book. Veggies of all kinds definitely! Even though I didn’t taste this I still love this. Hope its delicious. The recipe looks delish! My favorite unprocessed vegan ingredient? It’s a tie between avocados and butternut squash! Looks like a beautiful book! My favorite vegan food is Bananas!!! Great recipe.. My favourite vegan food is avocado..
My fave unprocessed vegan food is dates and avocados, I can’t pick! I almost hesitate to say it BC it’s so trendy now but my favorite vegan item is natural, preferably organic avocados! I love that color and texture and they’re so versatile….and inexpensive. Thanks for your useful information.But shall you post your dish with step by step images with us.